One advantage of having many projects on the go at any given time is that my FO’s tend to come in spurts. Besides filling me with a sense of accomplishment, this gives me something to talk about and lots of pictures for you to look at. 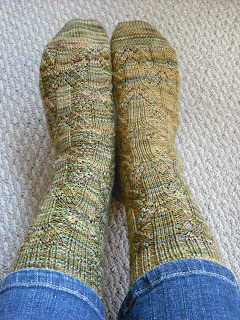 Woodelves in Fleece Artist Trail Socks in the Boreal colourway for SKA’s October challenge. I love how these turned out. My latest pair of plain socks in Hazel Knits’ “Hometeam Baseball” colourway. I call these my Hometeam Baseball Hockey Socks because they not only feature the team colours of the Seattle Mariners, who I cheer for when I am not pulling for the Toronto Blue Jays, but also those of the Vancouver Canucks, my hometown hockey team. 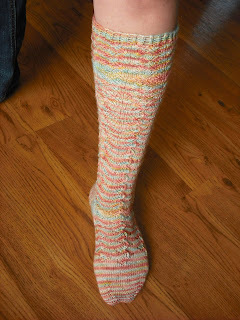 I like how the variegated yarn knit up and the socks are simple but cozy. 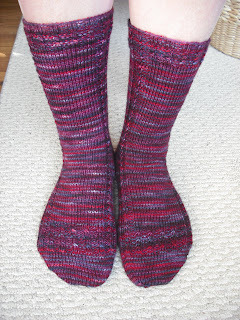 Balance Socks in Handmaiden Casbah in “Blackberry”. I love everything about these socks. Usually by the time I finish the second sock I am ready to be done but I enjoyed this knit so much I was sorry to see it end. 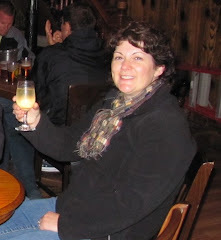 I loved working with the yarn, which features shades of blackberries in every stage of ripeness. Good enough to eat! Once I decided to make the Temperance Stockings I couldn’t wait to cast on. I knit almost nothing else for three days and Voila! I had a knee sock. This project has really taken me out of my comfort zone, Not only am I knitting a pair of knee socks for myself (and striped ones at that! ), I’m not even squirming (too much, anyway) over the inevitable pooling that results from the calf and gusset decreases. As the mornings and evenings get cooler I am looking forward to pulling these on with my pajamas. 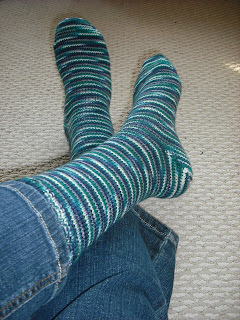 With only one pair of SKA socks to knit this month I was free to work on other projects. I finished the back and one front of the Twigs & Leaves cardigan but they’re all curled up and therefore not photo-worthy yet. 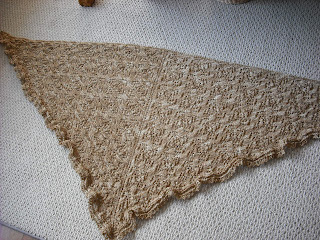 On Friday I cast off not one, but two shawls that I began this summer. The knitted-on edging of the Creideamh shawl took several days to complete, thanks to the countless stitches and my ineptitude. 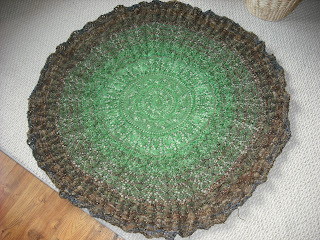 The crocheted edging on the Secret Garden shawl went much more easily and took only a few hours. This shawl had been marinating since the end of August while I dithered over whether I had enough yarn to knit one more row before casting off. I’d already had to eliminate half a pattern repeat because of insufficient yarn and I wanted to get all the mileage I could out of what I had left. In the end I decided not to risk it --the idea of picking back 768 stitches did not appeal to me. Predictably, it turned out I would have had enough for one more row but better safe than sorry. I’m hoping to block both shawls soon. Meanwhile, I have a few other projects on the go but I’ll save them for another day. 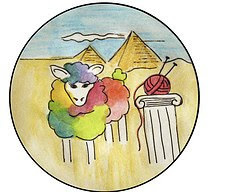 So when are you going to pick up the beautiful turquoise shawl to make into a FO again? Hmmm??? Lol! J/k! J/k!!!! I want to see both those knee socks though! Oh I really like the socks - all of them.